The latest edition of the Author Earnings Report is out today, and the news does not look good for the legacy publishing industry. You can find the report on the Author Earnings website, and you can find additional commentary over on The Passive Voice. Both are long and detailed, so I will only give you the highlights. The Big Five are still earning a disproportionate share of the ebook revenues, but it is not as large as it used to be. According to the report, the 1,200 publishers that make up the monthly AAP Statshot report only account for 32% of all Kindle ebook unit sales, down from 45%. 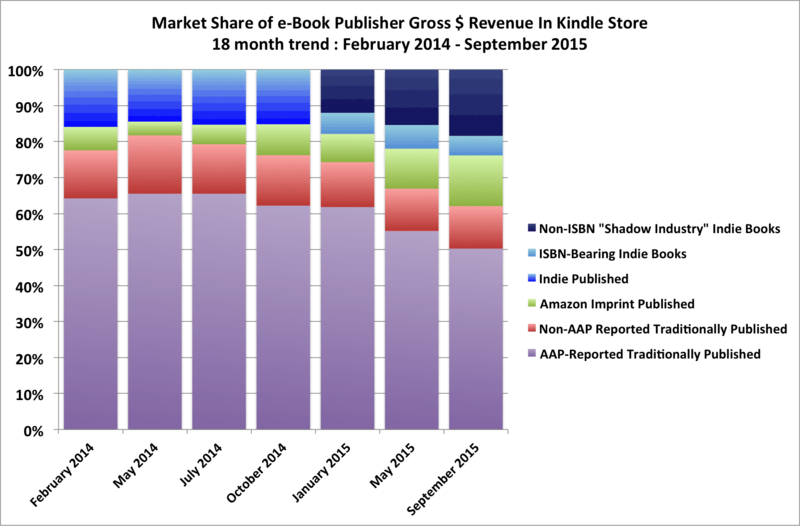 The AAP 1,200's share of gross ebook revenue in the Kindle Store is also down from its historical high of 64%, and now only accounts for 50% of unit sales. The Big Five account for about 80% of the monthly revenue reports (and that's based on the AAP's own list of participating publishers). The above stats don't reflect the print market, which still accounts for the lion's share of book sales (but will it stay that way forever?) so it is obviously less than a complete view of the book market. 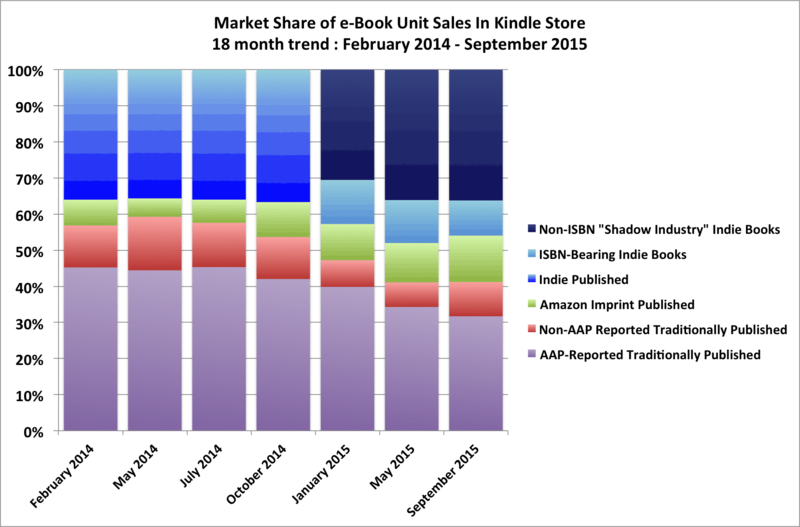 But this is enough to tell us that the AAP's recent reports of a declining market do not reflect the ebook market but publishers shrinking share of that market. The same is true for Nielsen Pubtrack, which (in spite of what they claim) tracks an even smaller share of the ebook market. And since we know that the official view of the ebook market is incredibly incomplete, how much do you want to bet that the print market will show a similar discrepancy? One point to remember at all times is that pbook retail dollars are not equal to ebook dollars because ebooks are over twice as profitable as pbooks (50% gross margin vs 20% or so for pbooks). Every 5% ebook revenue loss requires more like 13% pbook increases to offset. That is not happening. Since AAP numbers only report up to may, when the randy penguin was still wholesaling, their numbers have yet to hit bottom. A 10% gross sales drop for the year is well within “reach”, which could mean a solid double digit drop in profits. It’s going to get ugly. It sure isn’t. From 60/40 trad/indie to 60/40 indie/trad in a year and a half. It’s rather jaw-dropping.